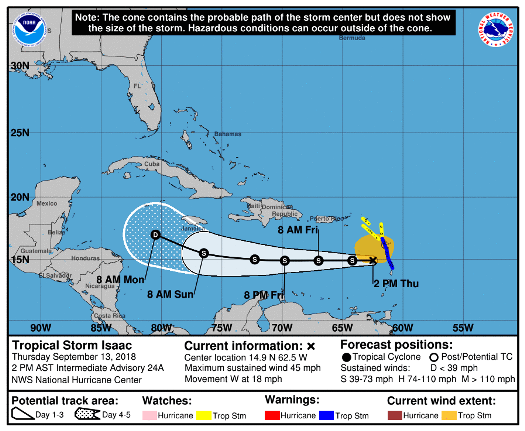 Tropical-storm-force winds are expected soon in the Leeward Islands as Tropical Storm Isaac approaches with 45-mph winds – Location: 25 miles east of Dominica ; Maximum sustained winds: 45 mph and Movement: west at 21 mph. At 8 a.m., the center of Tropical Storm Isaac was located 25 miles east of Dominica. Isaac is moving faster toward the west near 21 mph. This general motion is forecast to continue today with a decrease in forward speed over the Caribbean Sea. On the forecast track, Isaac should move across the central Lesser Antilles and into the eastern Caribbean Sea later today, and then move across the eastern and central Caribbean Sea through the weekend. Maximum sustained winds remain near 45 mph, with higher gusts. Little change in strength is expected over the next several hours as Isaac moves through the Leeward Islands. Gradual weakening is forecast after that as Isaac moves through the eastern Caribbean.